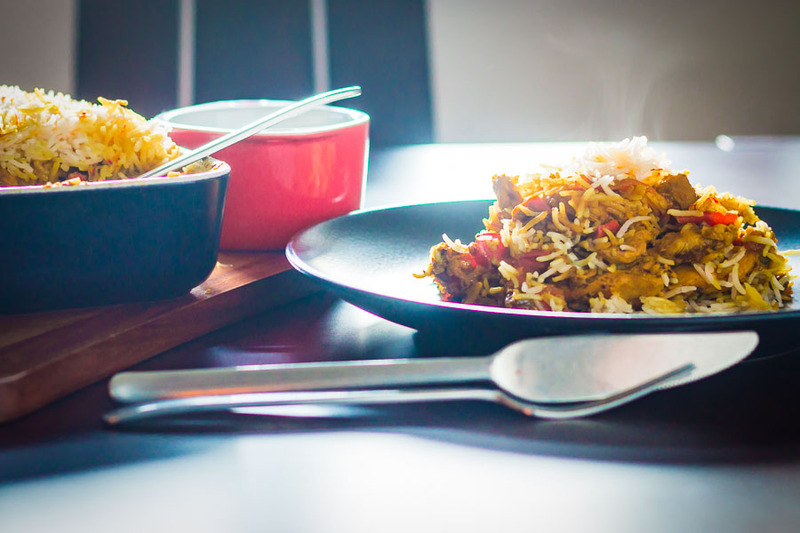 Like all good Biriyani or biryani, my Chicken Biriyani is a labour of love, set aside a couple of hours and revel in the rich and deep Indian Spices. Like many people in the UK my first introduction to Indian food was a Chicken Biriyani, or is it Chicken Biryani? It was the introduction to my local Indian Curry house. In many ways, it is a dish that began my love affair with spicy food. It is usually not too spicy and not as intimidating as some dishes on a menu, for many years it was my go to Indian food when we went out. Now my tastes may have moved on and my site is now littered with dishes like my Lamb Madras or Beef Vindaloo. But my love of a good Biriyani, particularly a Chicken Biriyani has not faltered. I appreciate that the recipe may look intimidating. It is a long list and I will not pretend that it is a quick dish to cook. However, despite the humble looks, it is truly wonderful because there are just layers on layers of flavours. These complex and rich flavours just cannot be replicated in any other way. There are hundreds of ‘quick Biriyani’ recipes all over the web and whilst I have not cooked them all I have ploughed through more than my fair share. Every one of them has in many ways disappointed. I am a huge advocate of ‘slow food’, I think it adds flavour that just cannot be created in a rush and for me, Chicken Biriyani or chicken Biryani is the very epitome of that. So what is a Biriyani? Well, that very much depends on where you are from. There are variants ranging from North India all the way through South East Asia and ‘Old’ Persia. They all have one thing in common layered rice with a dry curry. Rice provides so many comfort food recipes, from Risotto to Kedgeree and even rice pudding. 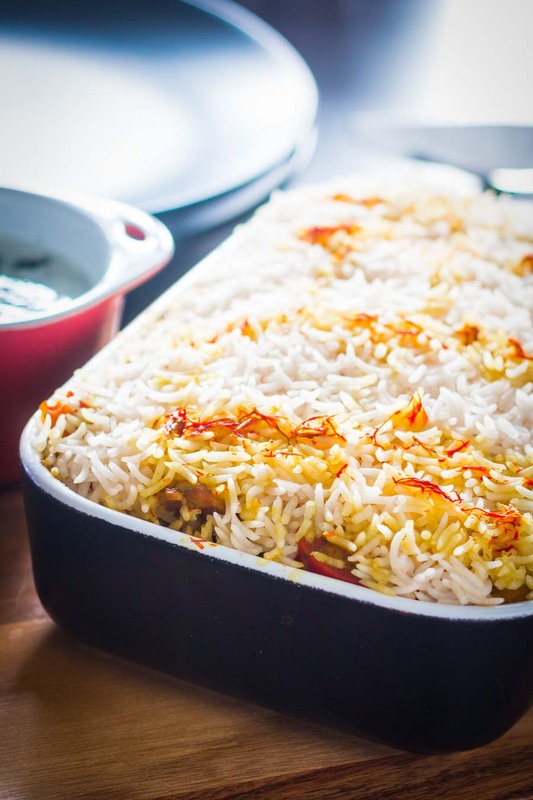 This Biryani recipe is another step in that direction, celebratory but comforting! My version is a mix of an Anglo Indian Biriyani that I remember from UK Curry Houses and unbelievable versions that I have eaten at Indian Weddings. Those really blew my mind! Apparently, it is a common wedding feast dish with many female folk gathering to make the feast. 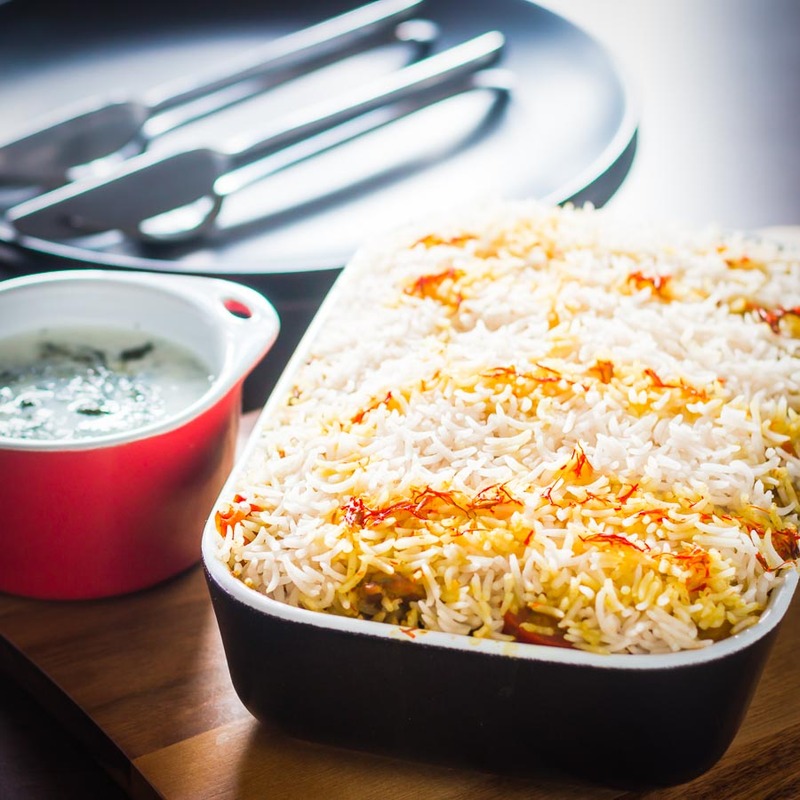 The Biryani is often considered to be the centrepiece of it all. One of these occasions was the first time I had eaten a Chicken Biriyani without a wet curry. The Chicken was so tender and the rice was unbelievable light with each of the grains beautifully separated. All served with pickles, chutneys and a yoghurt based mint Raita. This dish chicken Biryani recipe probably represents 10-15 years messing around with ideas, reading books and trawling the internet. How to Cook A Biriyani/Biryani. I have mentioned that the methodology and ingredient list for my Chicken Biriyani may seem intimidating. It certainly is time-consuming, but it is in no way shape or form a difficult recipe to cook. Quite the opposite it is really incredibly simple. You just gave to work methodically, read everything through and work out in your mind how you wish to work. Put the rice on to soak. Prepare the chicken thighs and place in the marinade. Prepare the other ingredients for the chicken curry. Cook the rice and set aside to cool whilst you work on the curry. Begin cooking the garlic and onion mix and by the time you have got to this stage your chicken is ready to go straight in. Layer and chuck in the oven and enjoy. I love cooking this dish and chose this week to do it to break out of my ‘fast’ food frenzy. Everything I have cooked recently has been design to be put on the table very quickly. It feeds the need to have something tasty to eat when we have finished tending our crops. Yes, quick food is good but for me, there is something special about a meal that has been loved and laboured over. I always find that the effort and time shines through in terms of flavour. So when I told my wife that I am taking a few hours off to make a Chicken Biriyani she was delighted. Sure it may not look as blingy and exciting as some of my recipes but this chicken biryani punches well above its weight in the flavour division! 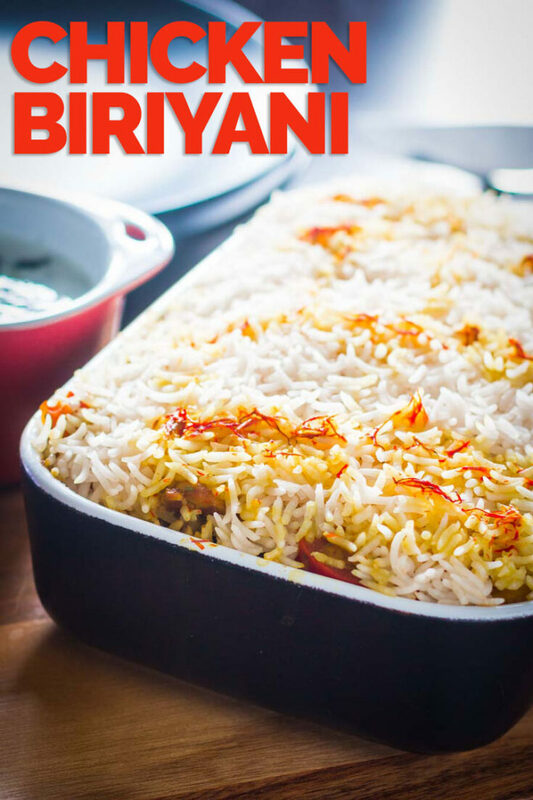 Like all good Biriyani my Chicken Biriyani is a labour of love, set aside a couple of hours and revel in the rich and deep Indian Spices. Mix together all of the ingredients for the chicken marinade including the chicken and allow to sit at room temperature for at least 1 hour. Wash the basmati rice thoroughly and allow to soak in cold water for 10 minutes. Now add all of the ingredients for the par boiled rice into a pan with the cold water and bring to a rolling boil. When the rice has been soaked, wash it again and place in the bottom of a pan. Add the salt and spice infused water and bring to a boil then reduce the heat and simmer until the rice is still a little under cooked, this should take approximately 7-8 minutes. Drain the rice and set aside, reserving the cooking liquid. Add the garlic, ginger and chili to a blender and grind into a paste adding a little of the rice cooking liquid if needed. Heat the cooking oil in a heavy based pan over a medium high heat. Add in the bay leaves, Cardamom pod, black mustard seeds and black onion seeds. The mustard seeds should begin to pop almost immediately, as soon as this happens stir in the garlic and ginger paste and stir until fragrant. Reduce the heat to low-medium and add in the onion and allow to slowly cook until the onions caramalise, this should take approximately 45 minutes. Stir in the turmeric, cumin, coriander and tomatoes and then add the chicken that has been marinading and cook until the chicken is nearly cooked, this should take about 30 minutes over a low-medium heat. You want the curry mix to be fairly dry to prevent the rice from becoming sticky. Stir in the 'controversial' raisins and begin to build your biriyani. Layer half of the chicken curry in the bottom of a 20cm x 15cm x 5cm oven proof bowl and compress. Then add half of the rice and cover the curry, compress again. Then the other half of the curry and compress. Finally add on the remaining rice, cover with tin foil and place in the oven for 25 minutes. If you are adding the Saffron heat 25ml milk in a microwave and add in saffron and allow to steep. Then remove the biriyani from the oven sprinkle over the safron and milk mix and return to the oven for 5 minutes. 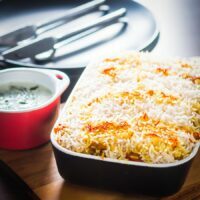 In the UK a Biriyani is usually served with a wet curry but I believe traditionally it is served with mint Raita and Indian pickles, I personally prefer just a mint Raita. 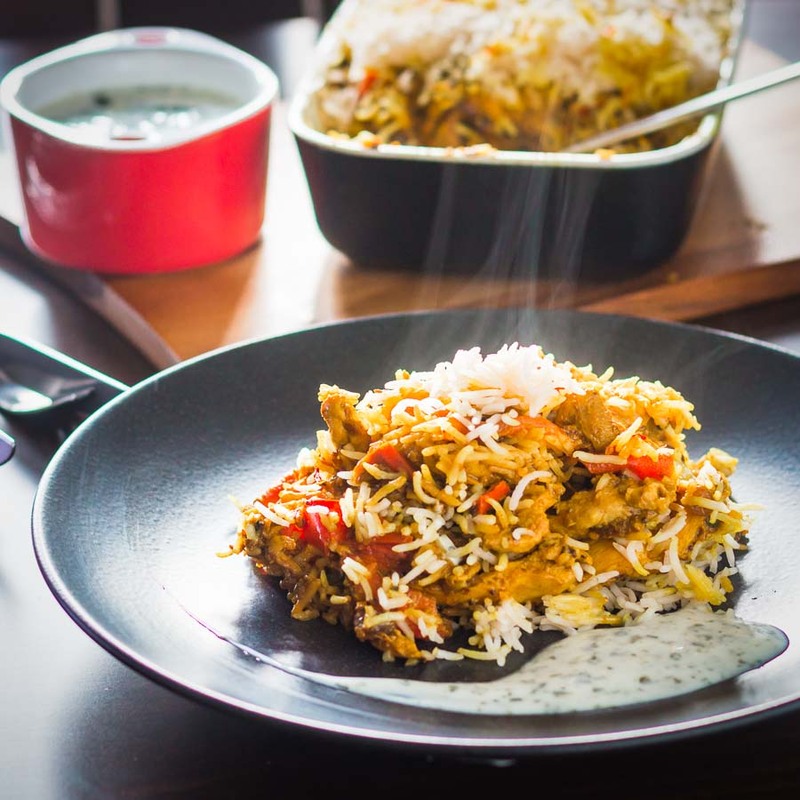 I love a good old chicken biriyani – it’s always a winner the more I make the more we eat – never seem to get any leftovers- we tend to make lamb biriyani more often – we just love any biriyani and only started making it about 3-4 years ago as I always thought it’s so difficult to make. I do make it my pressure cooker – so quick and super yummy ?. This is a really nice recipe Brian. Thank you for sharing! ?? I don’t think there’s anything better than enjoying making a curry – I love all the faff! Your biriyani looks delicious! I could not agree more, I love Indian food! Yum! I love how you break down the recipe into easy to understand simple 4 steps. Thank you!! Cooking Chicken Biriyani in the Hungarian Puszta is a bit out of the box for me. It doesn’t fit in somehow. I wonder whether anybody at all in your village has ever heard of it. But carry on Brian, show the stubborn Hungarians that there is a life over “bácskai rizses hús”. I always love it when you do Indian recipes, because yours are so different from the way I would make them. I really like seeing variety. Your biryani sounds wonderful! I think this response is the reason I love cooking, everything I read, see or taste gives me a fresh insight into someone elses dinner and that makes me hungry! This dish is such a delish! Fantastic photos too! I love biriyanii and this one looks so delicious! It’s a must try! Thanks Sam, we love it too. I love Biryani, one of my favourite food and we always cook it with chicken! I went through a phase when I had to have biriyani every week, thanks to a place that opened up close to my office. Yours looks amazing! Love the blend of spices in this dish. It must be so fragrant! I can imagine that the mint Raita must be a wonderful finishing touch. This is a great recipe Brian. 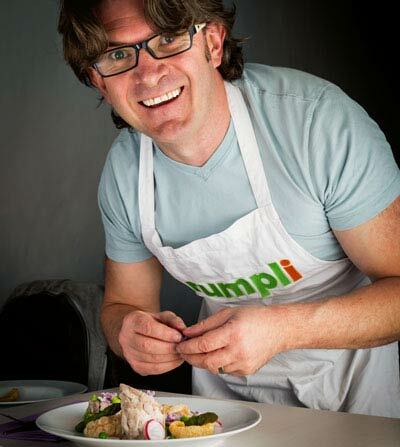 I love the long list of ingredients and enjoy that it is a 2 hour labor of love. I’m all for slow cooking. It’s more relaxing. Aren’t they just the best meals? Great looking dish by the way.